It's been said that we live in Paradise here in Florida. 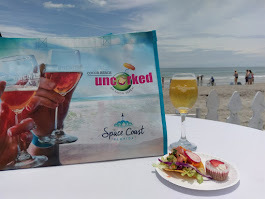 When husband-and-wife team Ken and Julia Rosenthal took the gamble and left their prior jobs to open a brewery of their own in Clearwater a few years ago, I think they found it. 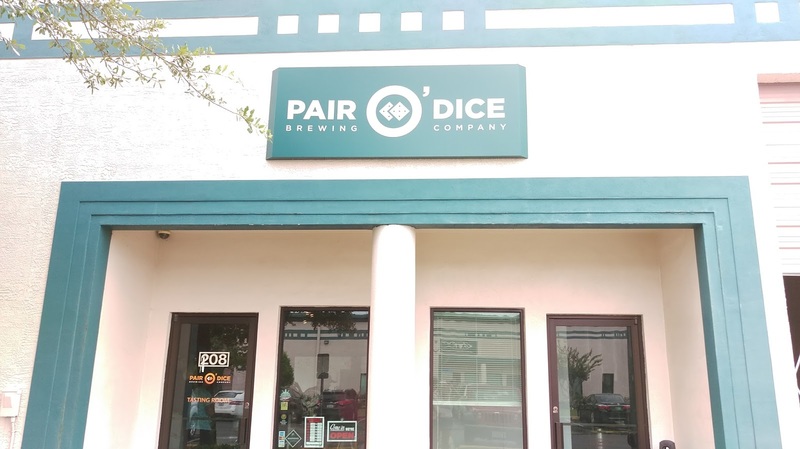 Welcome to Pair O' Dice.... 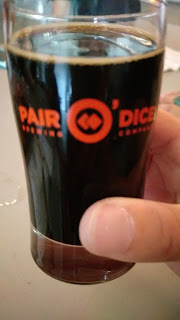 Pair O'Dice Brewing Company, that is. 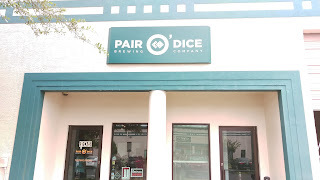 Pair O'Dice opened in October 2013. 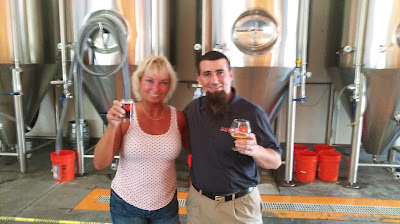 Ken and Julia previously worked for Anheuser, so they had experience in the commercial beer biz already. They returned to Florida from Austin, Texas in 2011, which marked their return to "paradise." And, they're also electrical engineers, so they obviously know how to figure stuff out. 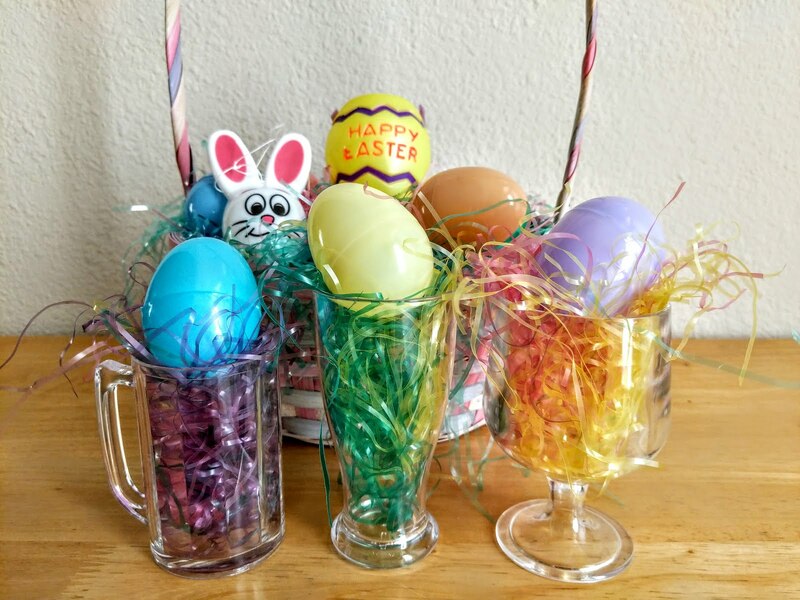 They had developed a love for hoppy, "West-Coast Style" beers, and with that focus, set out to brew beer generally along the hop-forward flavor parameters. 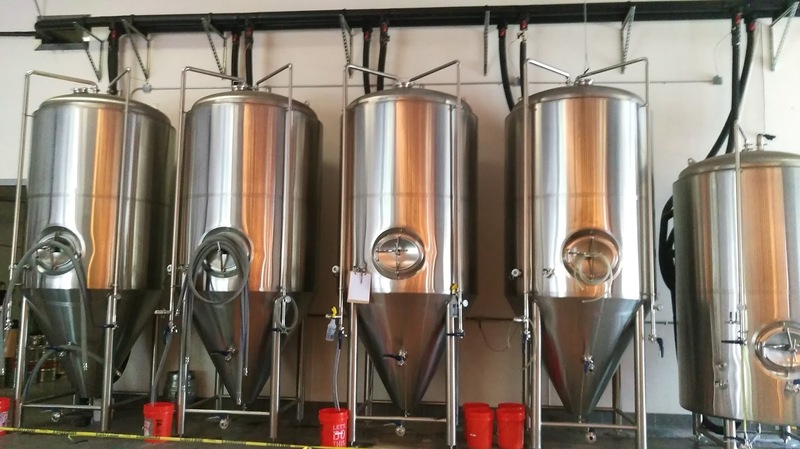 The brewery operates on a 10-bbl brewhouse, with four 30-bbl fermenters, and one 30-bbl brite tank. It has plenty of space for additional equipment, too. 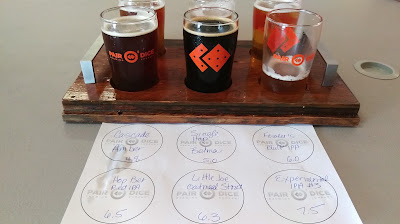 Yep, there's a tasting room, which offers 18 taps. On the day of my visit, the tap room offered 15 taps of their own beer. Quite a bit of beer to choose! If you like air conditioning, the tap room is climate-controlled. 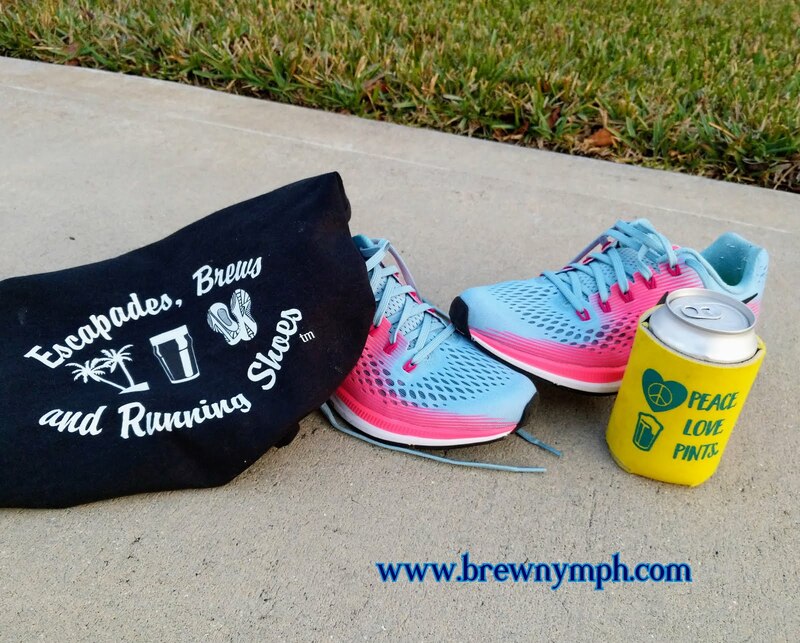 If you want to be where the brewing action is and can stand a little heat (there are fans), take a seat at one of the picnic tables in the brewery. Oh, look at these babies! On one side of the brewhouse stood a couple of wooden barrels. You'll have to wait til March to taste what's in there, though, because they're ageing a barleywine for Tampa Bay Beer Week. So, what are we drinkin' today? If you want a flight, you can pick as many as you want. I went full board. 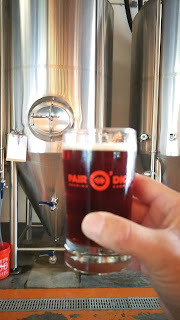 I started with the Cascade Amber (4.8 ABV), a light-bodied amber ale that features Cascade hops. It's a hoppy red ale, but I found it to be quite easy-drinking. Next up was the Belma Single-Hop IPA (35 IBU, 5 ABV). Pair O' Dice features a single-hop series on a rotating basis. The brewers change the hops, but keep the IBUs at 35. The showcase is on the hop. I haven't seen many beers that use Belma hops. There's a citrus, tropical aroma and flavor here, with a good bitterness, while being very drinkable. This is a good choice if you're looking for something a bit different. I really liked this one. The Fowler's Bluff IPA (50 IBU, 6 ABV) is your true West-Coast style IPA: yeah, you know what's in here: Cascade and Centennial, for floral, citrus and pine aroma and flavor. This one's a bit more bitter, but still not over-the-top. There's a dry finish. I must be getting used to these IPAs, because I also really liked this one, too! The Hop Bet Red IPA (50 IBU, 6.5 ABV) is one of the brewery's flagship beers. I thought this one had a bit of a bite. While the caramel malts are apparent, I found it to be just a bit more balanced toward the hops, and the citrus/floral notes really come through. This is a good, solid red IPA. And, that brings me to one of my favorite styles of beer, the oatmeal stout. 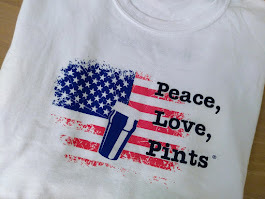 Yes, I do love a good stout! The Little Joe Oatmeal Stout (25 IBU, 6.3 ABV) has chocolate and coffee notes, and, I thought, a touch of dark fruit flavor. Nice and smooth, it's a good choice! 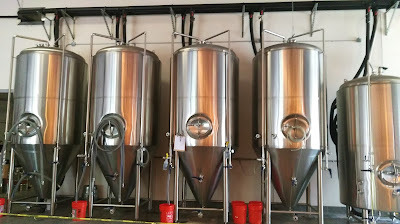 This day of my visit was especially exciting for the brewery (and, no, not just because I showed up). 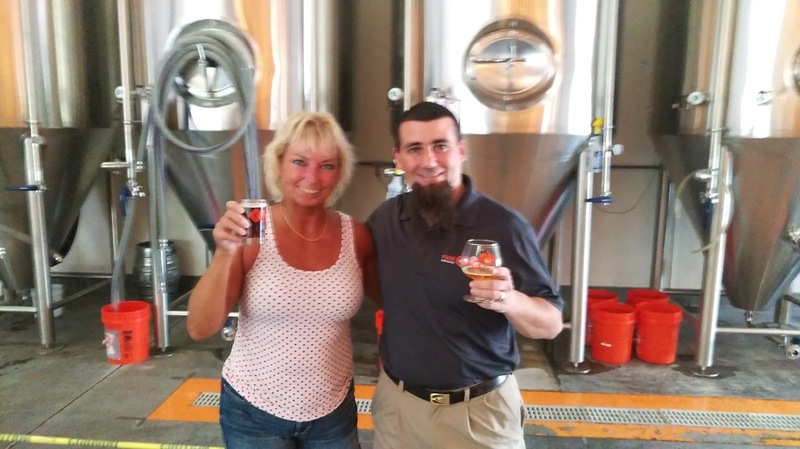 Earlier, Ken and Julia had made a pitch to the Winn-Dixie grocery store chain for distribution of two of their flagship beers, the Hop Bet Red IPA and the Clearwater Honey Cream Ale, which they expect to start canning soon, with distribution to hit the stores by end of year 2015. So, what about that Clearwater Honey Cream Ale (5.2 ABV)? It's made with local orange blossom honey and orange peel. It's not a "fruity" beer, though, and I didn't find it to be sweet. I detected a very slight corn flavor (not unusual in this style). Very fresh and easy to drink -- yeah, this is a good one. This is going to be one popular beer once it hits retail. Put these in your cooler. I'm looking forward to it already. 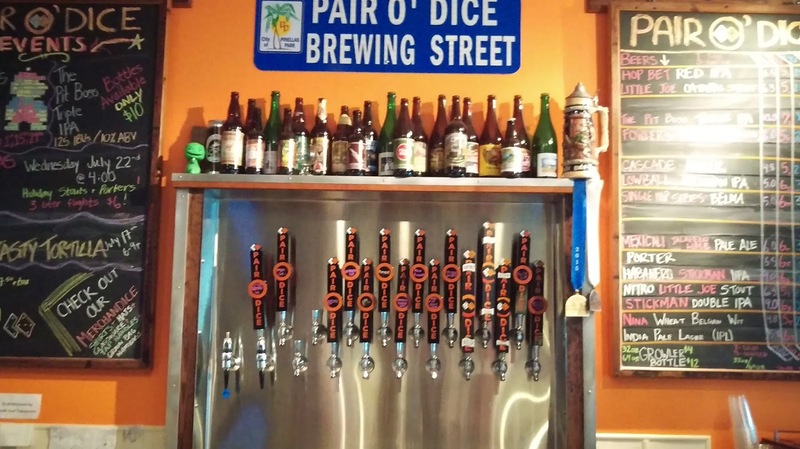 At present, you can find Pair O'Dice beers on draft in bars and restaurants in five Tampa area counties. 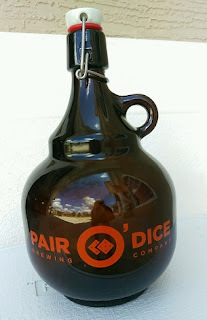 And, when you visit the tap room, don't forget your new half-gallon growler! That's where YOU come in. 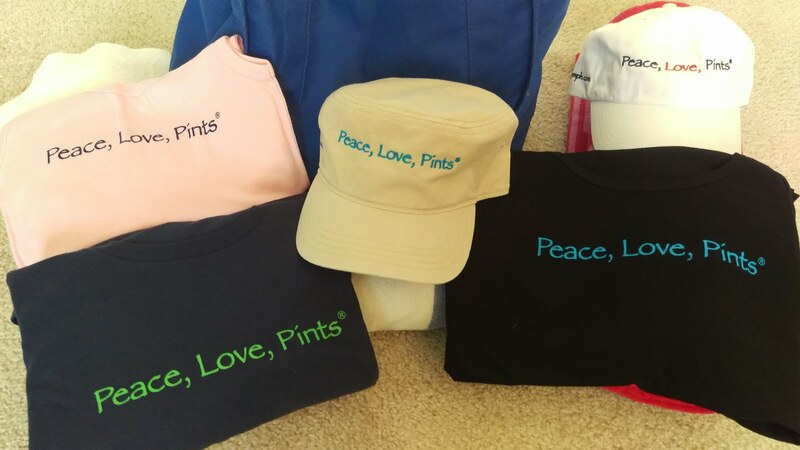 Check out the blog page on the Pair O'Dice website where they're asking you to help re-name the beer. The flavor profile and ingredients are listed, along with some suggestions for coming up with a new name (don't pick someone else's name, for starters). So, if you think you can come up with a clever name (maybe with a dice or gambling related theme), let 'em know by August 16, 2015. The winner will be announced on September 1. Great accolades to follow, of course! 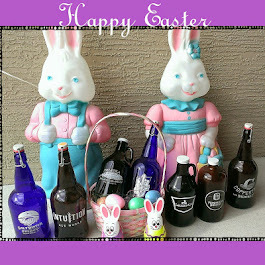 See the brewery Facebook page also. 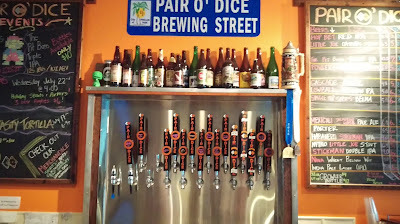 Pair O'Dice Brewing Company is located in an industrial center at 4400 - 118th Ave. North, Suite 208, in Clearwater, Florida. It's not too tough to find, but I'd suggest running a GPS or online map query. The brewery space is located just off of street view. The tasting room is open Wednesday through Sunday. I really liked talking to Ken, Julia and Kyle. And, I thought their approach to the brewery business was refreshing: let's brew quality, consistent beer. So, roll the dice and make a trip over the bridge to Clearwater. And, like they say, #GetAPair. You'll be glad you did. 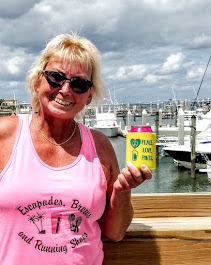 And, there you have it...another brewery visit! 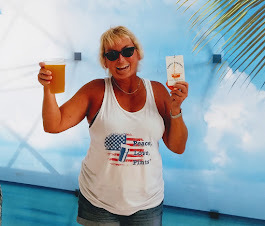 All of this writing has made me thirsty, so I'll see you around Florida somewhere...at a brewery, bar, or fest.